A Double Dragon for the current generation could have been a great thing, but this semi-revisiting of the franchise's heyday falls way short of the mark. A fair few titles from yesteryear have earned the right to be looked back upon with rose-tinted spectacles. Some of them were truly excellent games that even the most diehard retro hater would have to concede are fantastic products that should be played by all, even today. Others though, are remembered fondly simply because of the situations in which you played them. That time you finally beat that terrible port of Robocop because it was all you had to play and felt like the king of the world. That vacation where Enduro Racer was the only video game at the rundown amusement park that you stumbled across. That Christmas Day when you finally got your hands on a Genesis and couldn’t stop playing the dire Sword of Sodan because the stores weren’t open for you to be able to go and buy a copy of Sonic The Hedgehog with your Christmas money. 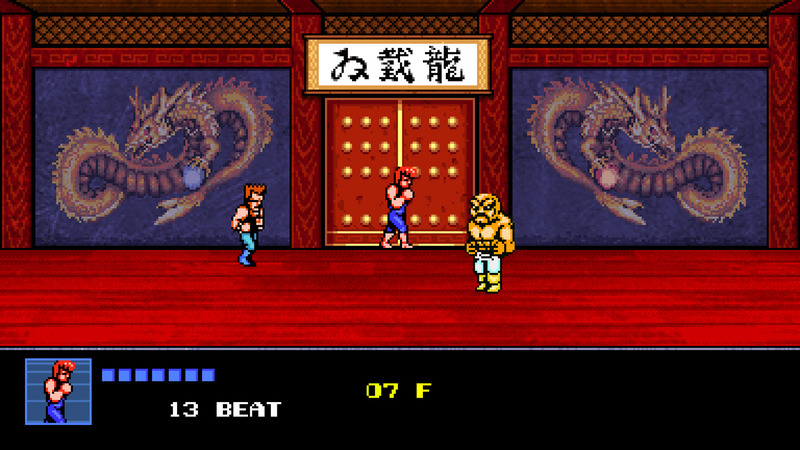 Double Dragon II: The Revenge for the NES is one of the titles that falls into the latter bracket. Probably the best home port of the arcade release, it was a decently playable game that was almost instantly surpassed by a wave of me-too titles that simply did a lot of things better. This is just one of the reasons why Arc System Works’ Double Dragon IV is so confusing as a whole. Firstly, it should be noted that this is pitched as a direct sequel to Double Dragon II, despite the fact that it’s called Double Dragon IV. We assume that since Double Dragon III: The Rosetta Stone exists, they couldn’t really call the game what it is, but there you go. Secondly, Double Dragon IV is very much based on the NES version of Double Dragon II, as opposed to the far better-looking arcade version. Again, it isn’t really clear as to why this is the case. The modern-day developers have gone as far with the NES love as to include synthetic errors – such as constant screen-tearing throughout the entire game – in order to make you feel as if you’re playing a title that was released just a year or so after The Revenge’s launch. Add that to the chunky, relatively under-detailed sprites, the noticeable flicker, and a palette of spot effects that are diabolically bad and distorted to the point of sounding broken, and you’ve got a real – albeit fake – piece of history playing out in front of your very eyes. This would all be so much more admirable, was it not for the fact that the game Double Dragon IV is based on has not aged particularly well. It features some of the cheapest and cheesiest arcade-style enemies in side-scrolling beat ‘em up history, who have no shame in dealing unavoidable damage when they feel like it. Of course, this makes sense in an arcade game that’s trying to take your money, but the fact they made it into the console port makes somewhat less sense. Furthermore, that they then make it into the created-exclusively-for-console Double Dragon IV is straight-up confusing. You can get your own back by pulling off some cheesing of your own to get past standard screen-filler characters of course, but in another confusing move, you can also do that against a lot of the larger enemies, too. Most characters in the game can be defeated as soon as they get stuck in a loop of get up, get punched, fall down, get up, get punched, fall down. This even goes for the final pair of boss characters who, unbelievably, are basic enemies with a few differently-coloured pixels and who are absolutely no threat. It’s soul-destroying to get to the last mission of the game, take down what look like a pair of standard characters with repeated spin kicks, only to presented with a message saying that you’ve completed the game. This assumes that you actually make it to that final mission. 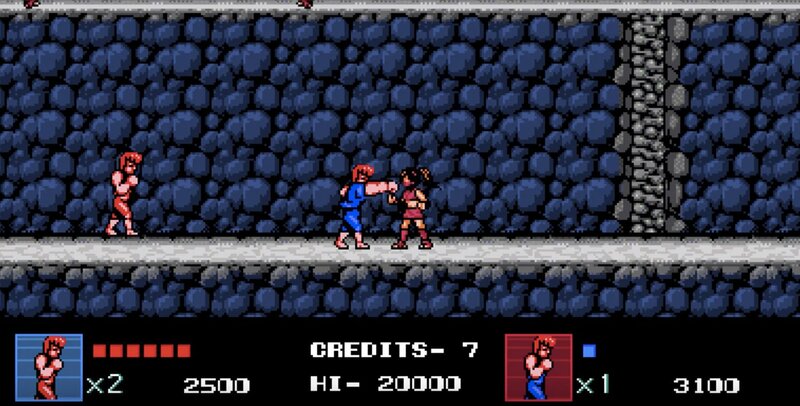 While Double Dragon IV isn’t particularly tough in the grand scheme of things, there’s some ultimately shocking level design along the way that crashes head-on into some unresponsive controls to make for a really bad time. A couple of light platforming sections that see you standing on a disappearing platform whilst waiting for another platform to become available for stepping on, only for that not to happen before the one beneath your feet vanishes and you die, will be enough to make some folks put the controller down and walk away. Another sticking point comes when facing any sort of gap that needs crossing. Enemies are often too stupid to jump across to get at you, meaning that they’ll just stand at the edge and wait until the end of eternity. The second you go airborne to make the jump, they will too, usually being given the upper hand in the foot-to-foot combat and kicking you to your death. There are also bugs to contend with, some of which are to the player’s benefit. During my first playthrough, I happened across two instances of enemies being stuck in the scenery and turning into permanent blurs because the game couldn’t decide where to render them. Then there were the times when some of the more high-action foes would perform a sweet rolling jump clean over my head and off the level to their death for no reason. 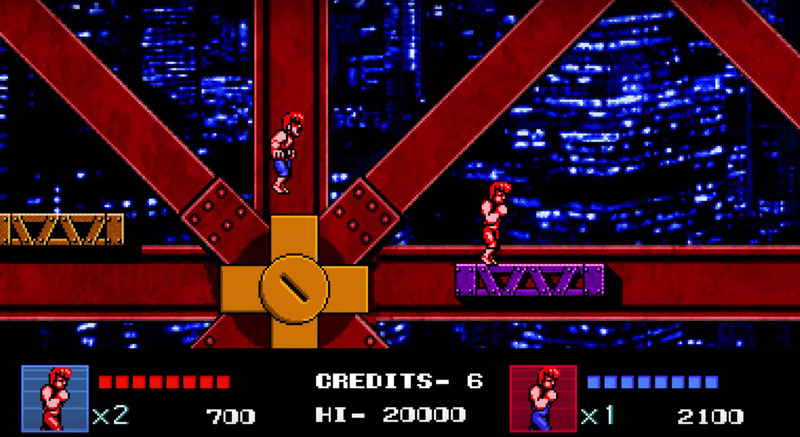 Enemies also get stuck in the game’s border which – ridiculously – is further to the left or right than the edge of the screen itself, meaning that you can get into some fisticuffs without being able to see your character or as is more often the case, allowing a CPU-controlled foe a clean shot at you because you don’t know that they’re even there. Adding a second player for co-op action helps, but I can see a fair few people giving up on this one before they’ve got to the end. Those that persevere will find that they unlock an interesting and more enjoyable experience in Double Dragon IV’s Tower Mode – where you’re battling level after level of increasingly devious enemies in an attempt to clear as many levels as you can. It says something that Tower Mode is about the only thing that will keep players coming back to the game, and it’s hidden behind lock and key until you’ve suffered through the main campaign. What you’ve got with Double Dragon IV is a confused concept. It’s a new game in an old franchise which has been designed to be played on a new platform whilst looking like it’s running on an old platform that played host to an inferior version of the old game. The possible benefits of bringing the new/old game into the current generation – online play and leaderboards, for example – have been entirely eschewed in favor of throwing in a handful of new moves and allowing in a bunch of bugs that make the game play somewhat worse than its 30-year-old prequel does. Those that absolutely adore the NES titles in the classic franchise will get some enjoyment here, but everyone else would be better off going for WayForward’s Double Dragon Neon or even getting that old SNES out of the loft for a round of the much more enjoyable Super Double Dragon.